Matthew Cooper of Eluvium talks to PopMatters about the creative process, taking the leap into the world of the double album, and following up the most daring album of his career. On the day I called Matthew Cooper -- the man behind the Eluvium name -- it was raining. Given that he and I both live in Portland, Oregon, this phenomenon of precipitation was to be expected; it's the weather that the Pacific Northwest is known for. But the next day, as I began the process of transcribing the interview, the sun was in full blast. It was as if spring and summer had come and gone in a day. To many Northwesterners, this temperamental climate can prove to be very frustrating; some don't like having to go back and forth between Birkenstocks and Toms on a day-to-day basis. As a parallel to the career trajectory of Eluvium, however, Portland's shifting sun to grey ratio is a perfect match. Since Eluvium's debut Lambent Material was released in 2003, his style -- while remaining distinct at its core -- has undergone many variations. With An Accidental Memory in Case of Death (2004), Cooper tried his hand at solo piano in the style of contemporary minimalist composers, with subtle inflections of the Romantic style he professedly draws much influence from. Copia (2007) took his ambiance to lush new heights. And, most controversially, Cooper took Eluvium into the realm of vocal pop with 2010's Similes. Like the long, formless pieces that make up much of Cooper's oeuvre, the project's career has undergone some surprising transformations. Now, with Nightmare Ending -- a voluminous, 83-minute double album -- Cooper has brought Eluvium to its creative peak. Things are no longer about a single, unique experiment or sonic idea; instead, Nightmare Ending collects every single facet of Eluvium into a gorgeous, unforgettable whole that's undoubtedly the defining record in Cooper's body of work. From the ambient pop epic "Don't Get Any Closer" to the near claustrophobic piano plinking of "Entendre", Nightmare Ending spans the intimate and the epic, the quiet and the explosive. It's not, however, an album of oppositional traits; rather, it's about synthesis and integration. What's truly amazing about the record is how despite being nearly an hour and a half long, it never feels overbearing; it makes you feel warm and right at home from the moment it begins. It's intimate in composition but universal in its feeling. The closest comparison I can muster is the song on LOST that would play after almost every death scene; there's a familiarity that makes the melancholy redeeming. With the rain quietly pitter-pattering against my window, I talked to Cooper -- who had just finished walking his dogs through the Portland gray -- about songcraft, limitations, imperfections, and following up Similes. Your music has always been expansive. What made you want to want to take your music in the direction of a double album, which broadens the arena even more? I'm not sure if it was really a conscious choice. There was definitely a part of me that wanted to not limit the scope of ideas. What I was trying to be able to do with Nightmare Ending was to allow myself to open up as a person and create without any boundaries or pre-conceived notions. So, it just sort of happened naturally; I gave myself as much room for any ideas I had in mind and be able to find a place for them. And it just so happened that my mind was ready to get a lot out, and that's just what it became. Have you placed limitations on yourself in the past going into a record? When I make a song, it's not so much about a compositional attitude; it's more about a mental space. A lot of the times I'll wait for whatever that energy or mindset is to become increasingly more powerful. Let it sit and brew until it becomes a really solid feeling. So I think the limitations of past records have been just that they were more specific. I don't know that anybody else would know that, but for me they've always been about something extremely specific, whether it be a time, a place, or a feeling. Whereas with Nightmare Ending I didn't want that to have anything to do with it. I didn't want there to be a story I was telling, or a very specific emotional place. 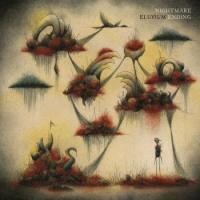 Nightmare Ending follows Similes, which you have described as a pop album. Do you imagine yourself going in that direction again? It seems like you've deliberately moved away from that style. I'm extremely proud of Similes; I gauge it as a personal achievement. I love doing music in all sorts of formats, and that was one I really enjoyed. But it's not something I'm itching to immediately do again. It was extremely mentally taxing from the lyrical standpoint. It would probably be awhile before I'd be ready to tackle something like that again. The big sea change that Similes marked for your sound was the inclusion of vocals. There's one song on Nightmare Ending that has vocals ["Happiness"], but there's a definite move away from singing. Do you imagine yourself making an album like Similes again but perhaps without the vocals? I hadn't really thought about that, to be honest. It's entirely possible; I'm not sure exactly what that would be. I tend not to think not too far ahead about what my next move is going to be. As you can probably tell from my back catalog, each one is quite different from the last. I think it's natural for a person to want to do something new or different from what they've just done. After Similes was released, I put out Static Nocturne, which was pretty much the antithesis to that -- it's one long noise piece. I do see myself doing another type of pop record; I imagine it would probably have vocals in it. A lot of the times I'll end up having three different ideas happening at once, and usually which one ends up tugging at me more I'll end up chasing after. As much as I think it'd be really nice to do something like Similes again, I don't know for sure if it will happen or not. Do you find yourself starting at a different place compositionally if you say to yourself, "I do want to include vocals!"? Yes. For instance, with Similes I knew it was going to be vocal-driven; that was the heart of it. That's why I called it a pop record, even though some other people still consider it a very ambient record. Because of the format, there's a very strict verse/chorus structure to the songwriting. There was something about that structure that was really interesting to me because I had never done anything like that before. It's very concrete; you're setting up barriers that you have to move within. But because you have that kind of footing, it gives you freedom to be able to do a whole bunch of other stuff, as long as you lay it on top of that bedrock. Looking to Nightmare Ending, I'm curious as to where you start when you're writing a formless or ambient piece. On "Rain Gently", for instance, I can't imagine finding a beginning point. It's not something where I sit down and think, "This is what I want to do." It could be me sitting on my back porch looking at bamboo, and suddenly the sound appears; then I go try and create it. Sometimes it works, sometimes it doesn't. [laughs] For a lack of a better description, it's sort of like throwing things at a wall and seeing what sticks. Because of the long gestation period of this record -- I started before Similes -- many of the pieces come before or after that album. That gave them time to become multiple different things. A lot of "Rain Gently" was a lot less structured than how it is now. Over time, it changed. I don't know if it was because if I wanted to adapt it to fit into a certain space within the record or whether it was because I had heard it so much in a certain phase that I decided to add something to make it new to me. Even though other people hadn't heard it, I wanted it to become something different than what I had found. For all the ambiance that's on Nightmare Ending, there's no real reason to paint a dichotomy between this and Similes. "Don't Get Any Closer" -- which has a melody my editor joked "Coldplay will be trying to rip off soon" -- with some modification could be a pop song. Do you ever find yourself taking a catchy, pop melody and turning it into something more formless? [laughs]Yeah, it does happen from time to time, and also from time to time the opposite. One of the things about releasing music is that between the writing, mixing, recording, mastering, and production, a person can go through so many phases of likes or dislikes about a piece. There were songs -- including "Don't Get Any Closer" -- where I started picturing old, jazzy records with string sections and stuff like that coming in. From that I actually started forming pop melodies. I've always considered Eluvium in general to be very pop-based. It's very melody-driven, and even though it has static in it sometimes, or other things that would keep it light years away from modern pop radio, inherently it's very similar. There are a couple of solo piano pieces on Nightmare Ending that harken back to An Accidental Memory in Case of Death. There's also piano, however, on ambient tracks like "Don't Get Any Closer". When you write material on the piano, how do you choose between turning it into something for solo piano or for something else? I don't really think about it; it just occurs. On some of the solo piano pieces, I definitely considered adding strings; I spoke with multiple string players here in Portland and elsewhere about recording simple cello or violin lines. In the end, they just felt nice being stripped-down and simple, and they have a sort of innocence to them because of that. Most of what I have been doing for awhile has been more keyboard oriented as opposed to guitar, for instance. But really the songs I write are sort of churning in my head and from that I go and try to make them; it just so happens that the keyboard is the outlet for them more often than not. Would you say there's an influence of classical music in your songwriting? Oh yeah, absolutely. I'm a very avid classical fan. I've grown up around it; my parents have always had classical music playing in the house. But they also had a lot of Simon and Garfunkel playing in the house too. Are there any composers in particular you find yourself influenced by? Chopin, hands-down, at least of the older "greats". That's fitting, because for Chopin -- like other Romantic composers -- music was about what's getting in your head out somehow. That's right. I've noticed with some of the older piano work I've done, there was a lot of similarity to Eric Satie, but I've always felt that Chopin was my closest match. Bach would probably be the second closest match; he had the melody, the heart, and the math all put together. Nope, no birds. But yes, they are field recordings. It's actually a mishmash of things happening. It's kind of weird giving away certain things: there's some prayer in there, as well as some percussion elements. But I won't say everything that's happening. Is there a role of nature in your music? Definitely. "Nature" is a pretty broad term, but even in the strictest definition yes, it very much applies. I find it at a simple level visually stimulating, but even in its simplest moments it's very complex and systematic. I find that interesting. The Pacific Northwest has been known to shape the regional scenes that occupy it; Pacific Northwest metal, for instance, has a very distinct sound. Does the area influence you uniquely? I'm sure it must. I haven't lived anywhere else in such a long time, so I don't know if I would be doing something different if I lived somewhere else, whether that was Southern California, Texas, Europe, or the Mediterranean. But surely it would have some sort of influence; for instance, it's raining with a blanket of gray over the city [Portland] right now. If it were sunny I imagine it'd change my perspective a bit. [laughs]Not necessarily about life in general, but I may choose to create something much more light-hearted because of that. Do you ever write music on the road? I may sketch things out a little bit, but not really. I've had to do some, but usually it wasn't in the compositional phase, it was more in the mixing/editing stage, which didn't usually work out well. I usually find myself too distracted then. Given the ethereal form your music often takes, I imagine it's hard to create an Eluvium live experience. Given the depth of Nightmare Ending, do you imagine struggling trying to re-create that live? A long time ago, I wasn't really interested in performing live. But I was coerced or simply asked by friends to do it, which made the experience a little bit more enjoyable to me; I tend to be a homebody, I like my creature comforts. I also decided a long time ago that it wasn't about trying to re-create something on the album, but instead to create something live that is stimulating for whatever reason. I do find it hard to imagine going out and wanting to do exact re-creations of the record over and over again. It's much more interesting to try and develop something specific to the venue -- whether the venue is a theatre or a rock club -- rather than try to copy the experience of someone sitting at home listening to the record. I've been thinking about how to perform Nightmare Ending live, and I've got some ideas churning for sure, but it would definitely be different than the record. You describe the songs on Nightmare Ending as "imperfections." Could you speak to that? As I said, when I starting creating the record, I decided to not give myself any limitations. As the songs started to pile up, I noticed that certain pieces were what I would consider to be "imperfect". When I start going into the editing/weeding out phase, I can be insanely meticulous; it drives my wife crazy. It drives me crazy as well. With this stuff I was trying to not do that; I wanted it to be a little bit more raw. When I was listening through everything, there were pieces where I would normally try to go in and change or redevelop to make it more "magical", I guess -- a kind of "suspension of disbelief" type of feeling. Some other songs would come out more clean or dreamlike. From this I started to separate things into categories of "dreamlike" or "perfection" versus "imperfection". Similar to the idea of dream versus reality. As time went on, I started to really be engaged by those imperfections. They were what made it human and beautiful; I grew attached to them. It basically became a big mental issue for me, realizing that the imperfect stuff was actually the true, perfect stuff. This was what led to my shelving of the recording entirely to do something different, which was how Similes happened. Would you say trying to be perfect has held you back in the past? I don't know. I have a suspicion that it would probably be operating on a level nobody would notice -- maybe they would, I don't know -- but I tend to be over-analytical toward many things, and music -- at least, my music -- is one of those things. To me, in the past it was about having things perfectly wrapped up; if it didn't make sense all the way through, it didn't make sense at all. That could just be an OCD thing or something. Minute things that no one else would have cared to recognize. Who knows? Nightmare Ending is more or less the totality or summation of your career thus far. It has solo piano pieces, ambient tracks, and even some pop songs. How do you see this album fitting into your discography? I kind of agree with that; it hadn't been until after the album was done and I had titled and finished it that I started realizing that's what it had become. Not necessarily just musically speaking; on a personal level, there's something going on with the story arc [of my career] that developed by itself. [The album] is both a summation and an expansion of everything that's happened so far. There's a play on words in the album's title. Is the nightmare ending, or is the ending itself a nightmare? It's a double entendre, so it means whatever you see it to mean. I've always been a fan of double entendres. Do you see it a particular way? From day to day, it's different. In regards to the album being created as an exercise, in relation to me as a human being, I find it to be the end of a nightmare, which was ... well, I'll just leave it at that.